Vriksha Vijnan Private Limited, Bengaluru - 560061, Karnataka, India. ABSTRACT: The plant Soymida febrifuga is called as Mamsaroyini in Sanskrit. It is an important medicinal plant belongs to family Meliaceae. This plant has got the traditional and ethnomedicinal significance. This is commonly used for Anti-inflammatory and also for joint pain, for cattle it is used for easy placental expulsion in the tribal areas of North-eastern Karnataka. Keeping its medicinal significance in a view, the present study is focused on phytochemical and pharmacognostic studies, and results show the presence of secondary metabolites such as phenols, flavonoids, triterpenes, lactones, tannins, saponins, alkaloids which in turn may be the responsible for its medicinal efficacy. INTRODUCTION: A large tree of 20 m height; greyish green leaves, leaf rachis 25 cm long, leaflets 8-10, ovate or obviate, obtuse at apex, coriaceous; panicle equalling the leaves; calyx lobes ovate; sparsely pubescent; petals obviate, slightly fimbriate; ovary glabrous; capsule obovoid; seeds oblong, flattened. Based on the population decline, habitat destruction, and other factors, it is categorized under the threat status as lower risk 1. Detailed phytochemical and pharmacognostic screening of this plant is done to support the traditional and folk claims made by the practitioners regarding their therapeutic efficacy. In Puri district of Orissa, the bark juice of Soymida febrifuga is mixed with water and is taken orally for kala ajar (Blackwater fever) and also used in general debility 2. Jain (1980) in his ethnobotanical exploration in Madhya Pradesh observed the usage of S. febrifuga leaves and bark as a galactagogue. Pal (1981) 3 in his work on, tribals of eastern India mentioned the use of Soymida febrifuga to cure diarrhea in cattle. The Mundas use this plant for loose motion, especially in goats. The Lodhas prescribe Soymida febrifuga when cattle stop mastication 4. Chopra et al., (1956) 12 have reported the use of bark in dysentery and as a febrifuge. 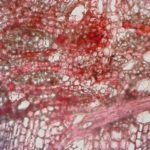 MATERIALS AND METHODS: The bark of Soymida febrifuga (Roxb.) A. Juss. Was collected and shade dried, powdered and extracted using Soxhlet extractor by ethanol (95%). Voucher Specimen: The plant material Bark of S. febrifuga A. Juss was collected from the Gulbarga University Campus, Identity was confirmed with the voucher specimen deposited in Herbarium of Gulbarga University, Gulbarga ( HGUG- 574) A Specimen collected for the present study with other details are deposited in HGUG for future reference. Preliminary Phytochemical Tests: The qualitative phytochemical tests were carried out for phenols, flavonoids, steroids, triterpenes, diterpenes, lactones, tannins, lignins, saponins, alkaloids following the methods of Gibbs (1974), Kleipool (1952), Peach and Tracey (1959) 5, 6, 7. Organoleptic Characters: The present investigation comprises studies on both physical and sensory characteristics such as color, sensation, taste, oily stain and mucilage of the species under study. Determination of Total Ash: Two grams of the powdered drug was incinerated in a sintered silica crucible by gradually increasing heat up to 450 °C until the drug is free from carbon and then cooled. This ash kept in a desiccator for 15-20 min and weighed using Anamed Electronic balance, India and noted down the readings 11. Where, weight of empty crucible = z, weight of plant material = y, weight of crucible + ash = z, weight of ash = z-x. Determination of Acid Soluble Ash: Total ash obtained was boiled for 15 min in 25 ml of 25% hydrochloric acid and filtered to collect the insoluble matter on Whatman filter paper and ignited in a sintered crucible. It was allowed to cool and then kept in a desiccator for 15 min. The residue was weighed in Anamed Electronic balance, and the soluble acid ash was calculated using the formula. Determination of Extractive Values: Hundred gram of powdered plant material of both plants understudy was extracted with ethanol (95%) and water using Soxhlet extractor. Thus obtained extracts were allowed to dry to room temperature. After complete evaporation, weight, nature, and color of the extracts were recorded 10. Fluorescence Studies: 9 The fluorescent study of the powder of the whole plant of A. paniculata and bark powder of S. febrifuga were treated with chemicals such as benzene, chloroform, acetic acid, ethanol, water, concentrated H2SO4 and concentrated HCl. The powdered materials gave different color reactions with different chemicals and fluorescent colors of treated and untreated drugs were observed under visible, and UV light and the observations were noted Table 4. Histological Studies: 8 To study the microscopical characters freehand sections were used. This section was washed in tap water and stained with saffranine for further observations and photographed using a Nikon microscope. Preliminary Phytochemical Tests: In the present study of preliminary phytochemical test on S. febrifuga almost all the secondary metabolites were present which was shown by a positive result. Whereas for steroids it was showing negative in Leiberman-Nuchards test, copper acetate test for diterpenes, Feigels and Baljet test for lactones and Lebat and Lignan test for lignins Table 1. Phenols: S. febrifuga responded positively to hot water test as indicated by the formation of the brownish black ring at the junction of the dipped and undipped portion of the leaf. Ethanolic extract of S. febrifuga responded positively to phenol test by producing intense coloration after adding with ferric chloride solution. Flavonoids: The ethanolic extract of S. febrifuga has shown a positive response to flavonoid test by producing red coloration. Similarly, the positive response to Shinoda test by producing magenta color indicating the presence of flavones in ethanolic extract of S. febrifuga. Steroids: Ethanolic extract of S. febrifuga has shown positive response to Salkowski test by producing wine red ring at the junction of 2 layers but, ethanolic extract of S. febrifuga responded positively to Leiberman-Buchardt test by producing red coloration. Triterpenes: Ethanolic extract of S. febrifuga has indicated the occurrence of triterpenes by responding positively to both Salkowski and Leiberman-Buchardt tests, by producing golden yellow color after shaking vigorously and red ring respectively. Diterpenes: Ethanolic extract of S. febrifuga responded negatively. Lactones: Ethanolic extract of S. febrifuga responded positively to Fiegel's test and Baljet test by producing light pink and yellow colors respectively. Tannins: Ethanolic extract of S. febrifuga has responded positively to tannins by producing white precipitation. Lignans: Ethanolic extract of S. febrifuga responded negatively to the presence of lignans. Saponins: Ethanolic extract of S. febrifuga responded positively to the saponins by producing foam after rigorously shaking with water. Alkaloids: Ethanolic extract of S. febrifuga responded positively by producing creamy white, reddish brown and orange-red colored precipitation to Mayer's, Wagner's & Dragendorff's reagents respectively. The results of preliminary phytochemical tests indicated the presence of almost all groups/classes of the secondary metabolites in S. febrifuge. In S. febrifuga except for diterpenes. Physico - Chemical and Fluorescence Studies: One of the major problems encountered with the herbal product is quality of the drugs, toxic compounds, heavy metals, authentification of the specimen, etc. There are several morphotypes, and chemotypes of the plants are observed in natural condition since they exhibit phenotypic and chemotypic plasticity under such circumstances, the quality control of the raw drug plays an important role in the standardization of herbal drugs. There are several such studies on pharmacognostic aspects of raw drugs. Organoleptic Characters: Organoleptic characters include the character that one can feel with sensory organs. This character includes the color of the powdered drug, sensation, taste and oil or mucilaginous feeling. The details are indicated in Table 2. Physical Content: The evaluation of drug needs its identification and can be done by morphological or microscopic characters. Even after identification, it may be of substandard quality due to either incorrect collection or improper storage. Thus to prove its acceptability as the drug it is important to know some physical constants such as ash values and extractive values Table 3. Ash Content: The ash which remains after incineration of the drug may contain some inorganic compounds such as phosphates, carbonates, silicates and silica which are naturally occurring in drug or added deliberately in the form of adulterants. Many times crude drugs are mixed with mineral substances like sand, soil, calcium oxalate, etc. An ash value is a criterion to judge identity and purity. Hence, the study was undertaken and the results are recorded. Extractive Values: The extracts obtained by exhausting crude drugs are identifying markers of their chemical constituents. Taking the chemical nature and properties of contents of drugs in consideration alcohol and water are used to determine the extractive values, as alcohol is an ideal solvent for extraction of various chemicals like tannins, alkaloids, resins, etc. and in water many primary and secondary metabolites like tannins, sugars, plant acids, glycosides, etc easily dissolves. The percent of the extractive value of alcohol is (22%). Water-soluble extractive value is 28.7%. Outer layer of the cork covered by radially arranged cells of variable size and form commonly contain clusters of crystals. Rays extending to the inner boundary of cork layer, mostly two cells wide but sometimes four. Cells of phloem parenchyma with thicker walls than those of the rays vertically elongated containing calcium oxalate. 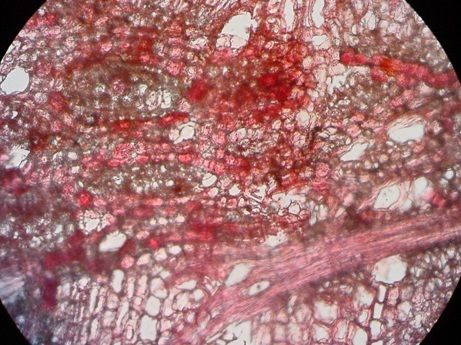 Phloem parenchyma transverses by tangential bands of sclerenchyma, bounded by external tissue of disorganized sieve tubes. Calcium oxalate crystals sometimes of unusual from. CONCLUSION: The results indicated that S. febrifuga has secondary metabolites such as phenols, flavonoids, alkaloids, steroids, tannins in them. But, diterpenes are absent in S. febrifuga. The pharmacognostic studies revealed that the physical constants are reported in this plant for the first time as there are no other reports. The histological studies help authenticate the drug when raw drug bark is supplied. CONFLICT OF INTEREST: There is no conflict of Interest. Seetharam YN, Halashi C and Vijay: Medicinal plants of North Eastern Karnataka and their status. My Forest 1998; 34(2): 767-772. Indian Pharmacopoeia for Antimicrobial studies 1985. Pal DC: Plants used in treatment of cattle and birds among tribals of Eastern India. In Glimpses of Indian Ethnobotany. Oxford and IBH publishing Co: 1981: 245-57. Jain SK: Glimpses of Indian Ethnobotany. Oxford and IBH publishing, London. 1981: 215-255. Gibbs RD: Chemotaxonomy of flowering plants, Mcgill Queen's University Press, Montreas 1974; 1: 523-619. Kleipool RJC: Constituents of Andrographis paniculata. Nature, London, 1952; 169: 338. Peach K and Tracey MV: Modern methods of plant analysis. By Springer-Verlag Ohg, Berlin. Heidelberg, New York, Published by Narosa Publishing House, New Delhi. Vol. II. 467-474, Vol. III, 1959: 586-589. Wallis TE: Text book of Pharmacognosy, CBS Publication and Distributors, Edition 5th, 1957: 389-396. Chase CR and Pratt R: Fluorescence of powdered vegetable drugs with particular reference to the development of a system of identification. J Am Pharm Assoc 1949; 38: 324-331. Raghunathan: Pharmacopoeia Standards for Ayurvedic Formulations. Central Council for Research in Indian Medicine and Homeopathy, E-25, Defence Colony, New Delhi 1976. Chopra RN, Nayar SL, Chopra IC, Asolkar LV and Kakkar KK: Glossary of Indian medicinal plants; [with] Supplement. Council of Scientific & Industrial Research, New Delhi 1956. Anonymous: Indian pharmacopeia, Govt. of India, Ministry of Health, Controller of Publications, New Delhi, India. Vol. 2, 3rd edition. Danapur V and Seetharam YN: Pharmacognostic and preliminary phytochemical studies on Soymida febrifuga A. Juss. Int J Pharmacognosy 2019; 6(2): 80-84. doi link: http://dx.doi.org/10.13040/IJPSR.0975-8232.IJP.6(2).80-84. Authors Address: Vriksha Vijnan Private Limited, Bengaluru, Karnataka, India.